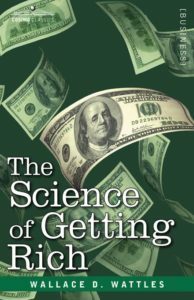 Wallace D. Waddle’s incredible book, The Science of Getting Rich, details how you can manifest success. Written in the early 20th century, Wallace was a pioneer in realizing and writing about the power of your mind. In Part 6 of my video series on The Science of Getting Rich, I analyze his belief on the further use of your will in attaining that success. Wallace says that you cannot retain a true and clear vision of wealth if you are constantly turning your attention to opposing pictures. Do not tell of your past troubles of a financial nature, if you have had them, do not think of them at all. Do not tell of the poverty of your parents or hardships of your early life. This will check the movement of things in your direction. Put poverty and all things that pertain to poverty completely behind you. By following Wallace’s theory of the universe as being correct, you are resting all your hopes of happiness on its being correct. Your faith will bring this to completion. No matter how horrible things appear in other countries, do not spend your time thinking about them. Please, interest yourself in your future. Wallace wants you to give your attention wholly to riches. To become rich, he writes, is the noblest aim you can have in life, for it includes everything else. On the competitive plane, the struggle to get rich is a Godless scramble for power over other men; but when we come into the creative mind, all this is changed. All that is possible in the new way of greatness and soul unfoldment, of service and lofty endeavor comes by way of getting rich. If you lack physical health, you will find that the attainment of it… is conditional on your getting rich. Only those emancipated from financial worry, and who have the means to live a care-free existence and follow good health practices, can have and retain health. Moral and spiritual greatness is possible only to those who are above the competitive battle for existence. Only those who are becoming rich on the plane of creative thought are free from the degrading influences of competition. You can aim at nothing so great or noble, I repeat as to become rich; and you must fix your attention upon your mental picture of riches, to the exclusion of all that may tend to dim or obscure the vision. You must see your life moving forward toward fuller expression and more complete happiness. Read The Science of Getting Rich each day and commit it to memory. There is a thinking stuff from which all things are made. In its original state it permeates, penetrates and fills the interspaces of the universe. A thought in this substance producer the thing that is imaged by the thought. Form and hold your clear mental picture of what you want and hold this relentlessly in your vision. Wallace says you must live and act in a Certain way and we cover this in part 7. This entry was posted in Uncategorized and tagged Carole Dean, film funding, manifesting, The Science of Getting Rich, wallace d. wattles by Richard Kaufman. Bookmark the permalink.